NCTE CONFERENCE – my first but not my last!! What an amazing weekend! I am fortunate to live in the Washington Metropolitan area so it was very easy to attend the NCTE conference as it was held nearby at the Gaylord at Harbor Place, 20 minutes from my house. My main draw was to go hear Ellin Keene speak on Saturday at 9:30am. I met Ellin when my daughter Bridgit began college. Bridgit became best friends with her hall mate, Elizabeth Keene, on the first day of college at Barnard. Once I met Elizabeth’s mom, Ellin, at Parent’s Weekend, we became friends, both around being Barnard moms and both around our love of literacy. So as I drove very early to the Gaylord on Saturday morning, I had ONE brilliant person to see. Who knew the two days would be FILLED with such rich discussion by so many brilliant educators around my favorite topic – strong literacy instruction. LUCY CALKINS with Amanda and Alex: After hearing Lucy’s description of what is involved on a conference, I realize I need to work on my conferences. I know the architecture of a conference but I am NOT doing it. Lucy reminded me of the WHY of conferring and the HOW of conferring. Now I just need to NOT just plan the daily mini-lesson but to also plan my daily/weekly conferences! so I did and then I went to hear him speak. He presented with a HS teacher who suggested that the oldest way of reading was the reading of animal tracks. She showed us a photo she took that looked like raccoon tracks in the snow. She simply asked us: WHAT DO YOU SEE HERE? and WHAT IS IT TELLING YOU? She shared how it is these 2 simple questions that guides her students to find patterns, motifs, images, and surprising details so they can comprehend any reading passage. Mary is the master of having her audience “read” videos. She had us watch three different New York City Public Service Announcements. She told us to come to this text with the understanding that it is about more than one thing. 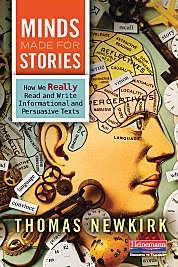 We need to read nonfiction closely. We need to talk back to it. We need to not be victims of nonfiction but actively analyze it, aware that a hidden agenda could be present. Mary reminded us that we don’t teach kids how to read nonfiction to pass a test. We teach them how to read nonfiction for the lives they will live. KRISTI and MARGORIE with Zoe – Chartchum ladies!! WOW!! What a great last session!! A teacher in Alaska and a teacher in Boston used kidblog to match each kid up with a student in the others class. Both classes were reading aloud Fig Pudding by Ralph Fletcher. Then one class created questions around chapters 1-4 of the book and the other around chapters 5-8. The students were tasked with writing a friendly letter to their partner and respond to the posted questions. The blog posting shared were amazing! One teacher said he reminded the kids that “their words were their face so be sure to represent yourself well in writing.” The teachers checked the letters and would not send it until it was following all the expected written conventions of 4th grade. I was amazed at the exchanges around a shared book. Then to skype with Ralph was just icing on the cake!! My daughter is working in a school in France right now. I think I want to try something like this with her school. In preparation, I am going to investigate kidblog and The Bread Loaf Teacher Network, two resources used by these two teachers. Thank you NCTE for coming to The Gaylord!! I can’t promise I’ll attend next year in Minnesota (seems far away and cold!) but I WILL attend again and I’m so glad I attended this year! !